Ella Rhodes reports on Professor Edgar Jones' talk at the Society's Annual Conference, held in Liverpool in May. 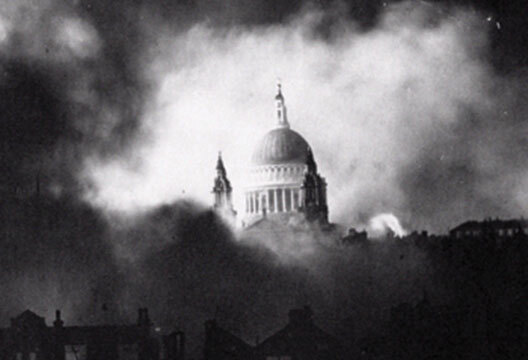 Professor Edgar Jones (Kings College London), a historian of psychology and psychiatry, opened this fascinating talk with an iconic wartime picture of St Paul’s Cathedral standing unharmed amidst the burning City of London. Yet the photograph is actually a composite of three images. Jones asked to what extent our knowledge about citizen responses to air raids in WWII is a myth, and what the reality tells us about mental health. Studying civilians during wartime is particularly interesting as it can give us an idea of how normal people deal with stress and trauma. Before the war there was a general opinion, influenced by Wilfred Trotter, a professor of surgery, that significant threats to life or independence made people pull together but only in groups that were closely bonded and disciplined. There was a view that more diverse or disparate groups would react with panic in such situations, and would require the military or the emergency services to manage them. Psychiatrists fed into this view at the outbreak of World War II, suggesting a network of special psychiatric hospitals be set up on the outskirts of highly populated areas to cope with the predicted influx of psychiatric patients. Yet historians cannot agree what actually happened among civilians in the face of air raids during the war. Some say morale was sustained and people got on with their lives as best they could, whereas another group argue there was large-scale fear, break-downs and mass panic. Jones said that because the Second World War continued for so long it is always possible to find examples of each of these reactions. The Ramsgate railway tunnels are one example of people, seemingly, being unable to cope. Thousands of people lived in squalid conditions inside the tunnels to escape extensive bombing in the area and many refused to leave. The authorities were concerned this was lowering morale and so brought in troops to clear people out. Great resilience in the face of disaster was also seen, such as in Bank Underground Station where a bomb on the main concourse sent a devastating blast straight down the escalators. However a Hungarian doctor, Z.A. Leitner, who happened to be in the station, went along the platform treating 40 passengers. He said he did not find a single hysterical or shouting patient. The idea of Blitz Spirit, Jones said, was perpetuated by the 1940 film London Can Take It!, which presents British civilians as a hardy bunch and an army in their own right, protecting the city and battling through the air raids. This was largely used to convince the Americans of our national resilience. However scientist and anthropologist Tom Harrison criticised this and argued that, if people looked under the surface, there were numerous cases of people suffering breakdowns and exhibiting psychosomatic disorders. However, Jones said, researchers J.D. Bernal and Solly Zuckerman looked into the impact of air raids on morale in Birmingham, which was economically thriving, compared to Hull, which was economically suffering. In Hull they found 53 per cent of the 700-strong sample suffered no symptoms with 20 per cent of men and 53 per cent of women showing a slight to moderate neuroses. They concluded morale was higher than anticipated and found little evidence of panic in Birmingham. Jones also pointed out that while the air raids killed almost 30,000 people in London this equates to only 0.3 per cent of the population. Across other heavily bombed cities the number of people killed did not exceed 0.6 per cent of the population (Coventry). In Coventry there were reports of panic on one particularly heavy night of bombing, but the chances of being killed in an air raid were mathematically slim. But the allies learned from this evidence and delivered attacks of great intensity. In Hamburg air raids killed almost 6 per cent of the city’s population. Could the British culture of stoicism mean that people were just keeping their distress to themselves? Jones pointed out that the middle-aged and older population during WWII would have lived through the First World War and may have been setting an example for the rest of the population, demonstrating the stiff upper lip shown throughout the earlier war. However this restrained response to psychological trauma could convert into physical symptoms – indeed, there was a rise in psychosomatic illness, particularly peptic ulcers. Jones concluded that there was no real evidence for a total collapse in morale during World War II, though there was a rise in incidence of psychosomatic illness, particularly among people who were exposed to the greatest risk such as those in the emergency services. So, how did people cope? Jones said people coped largely by engaging with the defence of the country. There were volunteering opportunities within the fire service, police and Home Guard which may well have offered people a sense of control which would be psychologically useful. What relevance may all this hold for the people of today? Jones said that these days we are encouraged to be emotionally intelligent rather than stoical, and in the 1940s there was a greater emphasis on social support even in cities and urban environments. We can see the differences in responses from the government too: Jones used the example of the ‘Go in, stay in tune in’ leaflet which was distributed by the Home Office in 2004 which gives people advice in the case of any kind of disaster. It encourages people to stay at home whereas in World War II civilians were encouraged to carry on as normal. Jones then went on to give conflicting examples of civilian resilience in modern times. Using the example of the five Sarin gas attacks on the Tokyo subway, Jones pointed out that the ratio of people who sought care after the incident compared to those who actually needed it was 450 to 1, suggesting a level of panic. Also during the 1991 Gulf War eight people died as a result of missiles from Iraq, but of those six occurred due to misuse of gas masks causing them to suffocate (the victims even included the medically trained). However, in contrast, after the 9/11 terrorist attacks civilians left the buildings in an orderly way and showed altruistic behaviour throughout. Could this be because an earlier terrorist attack on the towers had resulted in enhanced security and evacuation procedures? Jones concluded by saying that we know very little about the longer-term effects the extensive air raids in WWII actually had on civilians – how did people manage when peace returned? - Read more from Professor Jones in our 'Looking back' section and watch his talk at 'Stories of psychology'. You will find many more reports from the Annual Conference on our site, and more will appear in the July edition. Find out more about next year's event.